Welcome back to IBeautySpy! 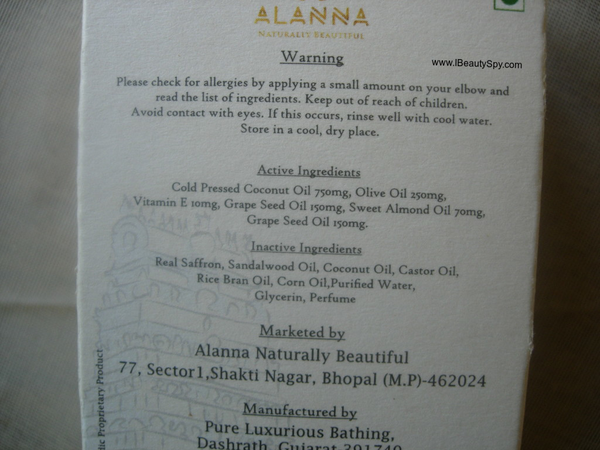 Today I will be reviewing my current favorite shower gel and soap from the brand Alanna Naturally Beautiful. I have already reviewed few of Alanna products before and they have never disappointed me. You can check out the reviews of Alanna Golden Glow Face Pack and Alanna Hair Strengthening Mask in the above links. 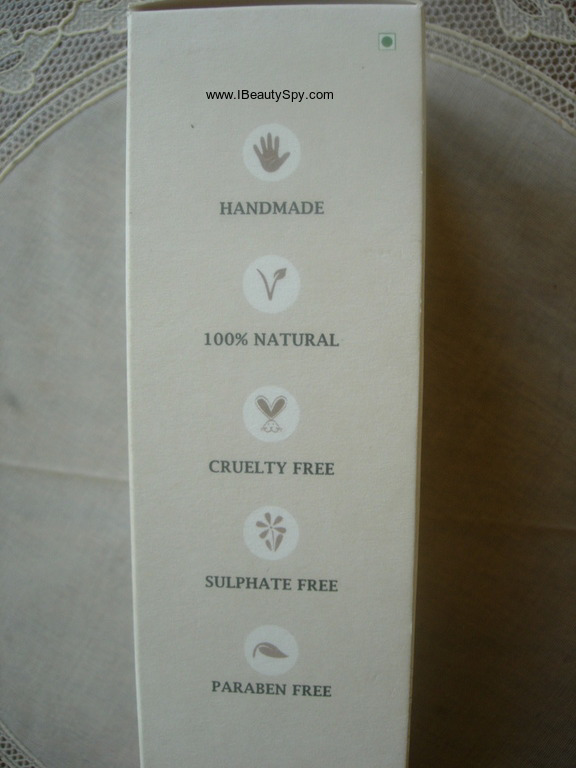 All their products are 100% natural, handmade, cruelty-free, sulphate-free and paraben-free. So in this post, let’s see how Alanna Sandal Vetiver Shower Gel and Alanna Saffron & Sandalwood Soap fares on me. Sandalwood and vetiver bath gel contains earthy, spicy scent to it that not only calms the skin down but also keeps it hydrated by increasing the skin’s moisture reception capacity. 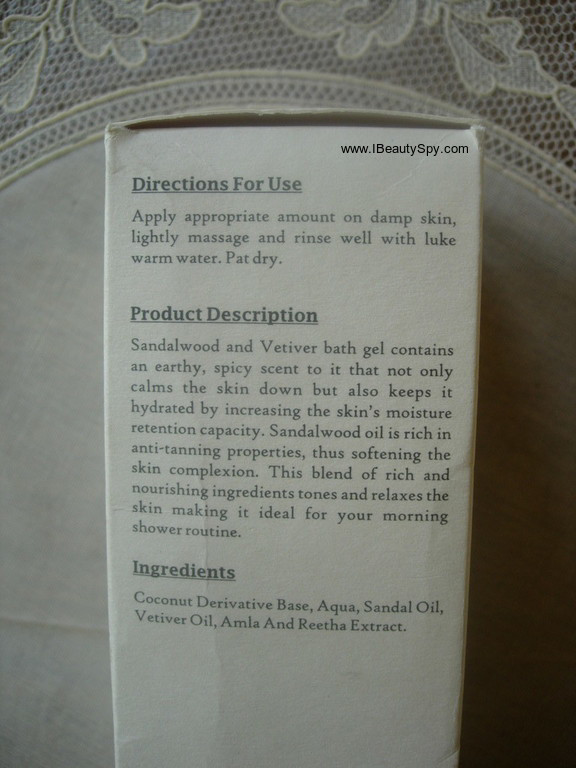 Sandalwood oil is rich in anti-tanning properties, thus softening the skin complexion. This blend of rich and nourishing ingredients tones and relaxes the skin making it ideal for your morning shower routine. Alanna Sandal Vetiver Shower Gel comes in a tall, transparent, plastic bottle with a pump packaging which makes it very convenient to use. I always prefer pump packaging more than flip-caps. But this might not be travel-friendly. I wish Alanna comes up with travel-sized products and kits. Alanna Sandal Vetiver Shower Gel is light golden yellow in color and has a runny consistency (In the swatches it appears colorless and the spoon looks almost empty 🙄). It has a strong scent of sandalwood and vetiver. Since I like sandalwood fragrances, it doesn’t bother me. But if you are someone who doesn’t like sandalwood fragrance, then I would not advice you this. 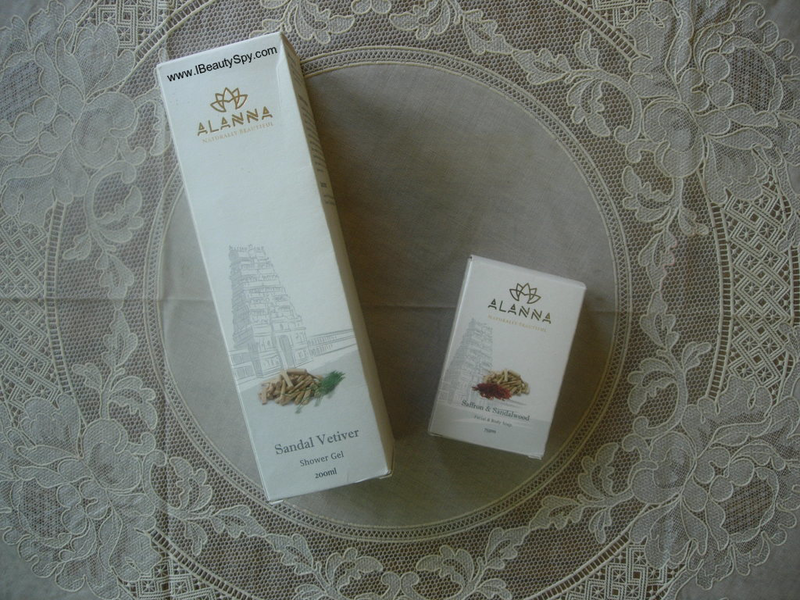 Alanna Sandal Vetiver Shower Gel lathers really well, so a small quantity is enough for each use. The lather is light and airy and not creamy. It cleanses skin very well and doesn’t leave any residue or sticky film behind. It does make skin a little dry, but not very dry like the usual drugstore sulphate-based brands. Though I always follow up with a body oil post bathing. I think this will be ideal for the coming summers, humid and sweaty climate and pollution. The scent lingers on your skin for around an hour or so. And the entire bathroom will smell good for a long time. Now the good part about this shower gel is that I have observed it removes tan very well. Yes, I was quite surprised by it too. A shower gel removing tan? But I was observing it for around 2 weeks and it did really help in removing tan and bringing back my natural complexion. So its claims of anti-tanning are correct. The sandalwood and vetiver also helps in toning and cooling the skin. I could feel my skin was smooth and improved complexion due to tan removal. 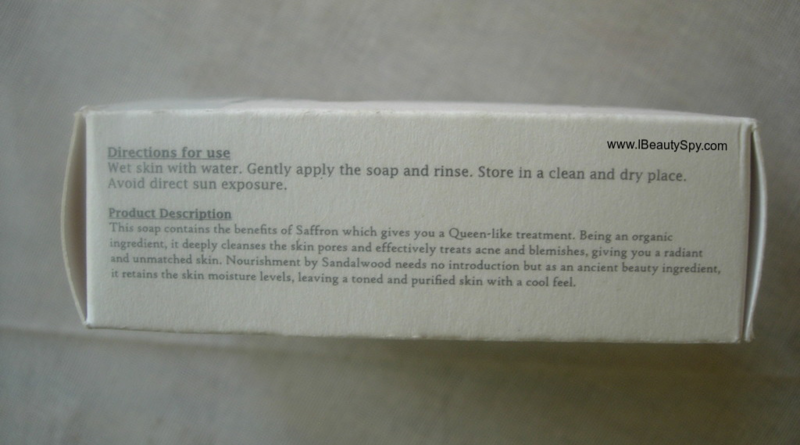 This soap contains the benefits of the Saffron which gives you a Queen-like treatment. Being an organic ingredient, it deeply cleanses the skin pores and effectively treats acne and blemishes, giving you a radiant and unmatched skin. Nourishment by Sandalwood needs no introduction but as an ancient beauty ingredient, it retains the skin moisture levels, leaving a toned and purified skin with a cool feel. 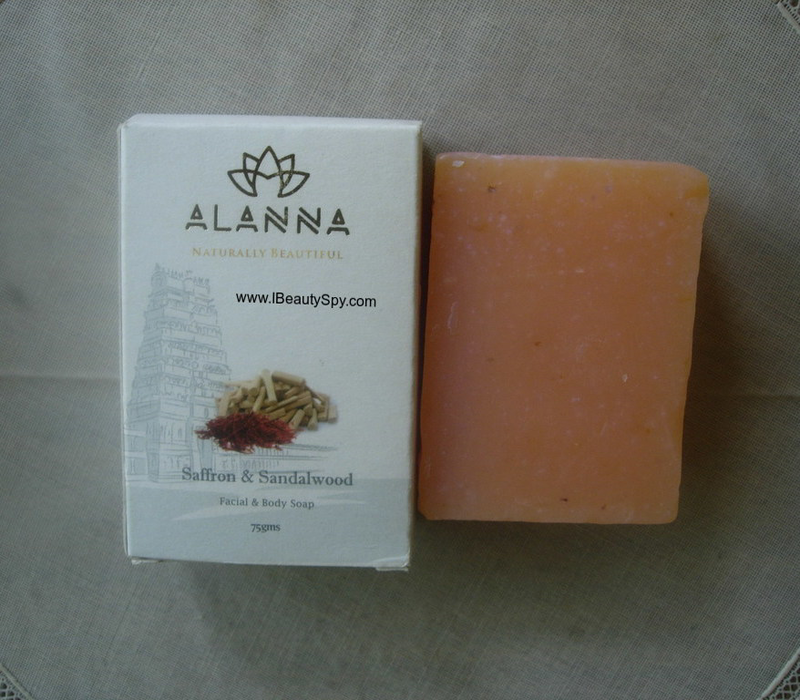 Alanna Saffron and Sandalwood Soap looks saffron color and has a mix of saffron and sandalwood fragrance. The saffron scent is more prominent. Saffron as you all know smells a little sweet and I feel like am smelling an Indian dessert 😀. I totally love it! Alanna Saffron and Sandalwood soap lathers very well, much more than the shower gel. It deep cleanses skin of all dirt, sweat and pollution. But it also makes skin more dry than the shower gel. If you live in a hot, humid, pollution-filled place, you will like this. You can also use it as a facial soap if you have oily, acne-prone skin. Coming to its claims of radiant skin, I haven’t noticed such an effect. I feel the shower gel is more effective than the soap. But the soap is very affordable. What I like about Alanna Sandal Vetiver Shower Gel and Alanna Saffron & Sandalwood Soap? * Handmade, sulphate-free, paraben-free, 100% natural. * Deep cleanses skin of all dirt, sweat and pollution. * Lathers very well, so small quantity enough for one use. * Both shower gel and soap have an amazing natural fragrance. If you like sandalwood go for the shower gel, if you like saffron (and Indian desserts 😊), go for the soap. * Scent lingers on your skin for an hour or so. * Makes your bathroom smell so good for hours. * Soap contains perfume in ingredients list. Shower gel, definitely yes! Soap if you have oily skin. Shower gel, yes. Soap, no (though I liked its fragrance). Soap is affordable and pocket-friendly. Shower gel is on the same range as compared to other natural, organic brands. I would say its worth it as its very effective. Overall, I totally loved Alanna Sandal Vetiver Shower Gel. Especially because it was so effective in tan removal. We all get tanned while going out everyday even though we wear sunscreen. A daily-use shower gel which can remove tan is great. I would definitely recommend you to try this. Follow it up with Auravedic Kumkumadi oil and you will be left with tan-free, glowing skin. Coming to the soap, Alanna Saffron & Sandalwood Soap is a pocket-friendly and affordable soap with goodness of saffron. Its worth a try. Anti tanning shower gel is a new thing for me, sounds good, thanks for sharing, will check the product.